I don't have anything against a microwave, it just didn't make the cut. I'm not laboring under the delusion that microwaves are going to give me cancer or destroy the nutrients in my food. It just takes up more space than we have in our tiny kitchen, and requires more electricity than we generally have to spare while living of-grid. One of the most frequent questions that we get from people with traditional homes is how we ever manage without a microwave. Popcorn. 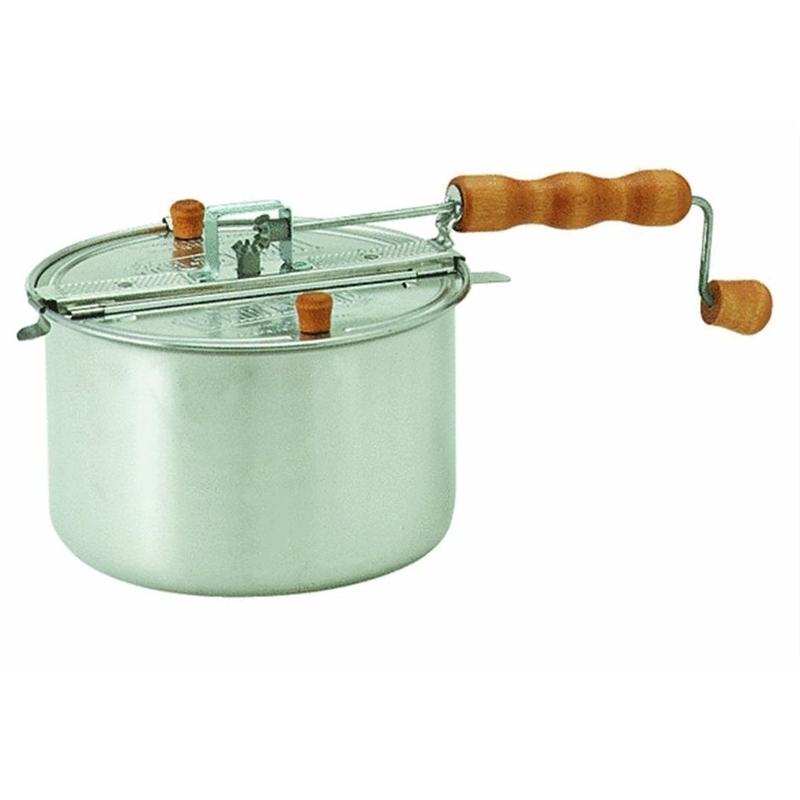 We keep a Whirley Pop for this purpose, but you can make popcorn in a steel mixing bowl or dutch oven just as easily. Heating water for tea. Use a tea kettle or a sauce pan with a lid on the stove top. Only heat as much water as you actually need, and it'll go a lot faster. A kettle with a wide, flat bottom will generally heat faster than a narrow one. Steam-in-bag frozen veggies. We buy fresh or the cheaper non-steam bags and use our steamer basket on the stove top. Frozen prepared foods. Not something we often buy anymore, but all the packages I've seen have conventional oven directions. Be sure to use our tips for baking in an RV oven for best results. Most people use their microwave mostly for reheating leftovers. Reheating food without a microwave is easy, and usually yields better results than a microwave would. Most foods reheat beautifully in the oven or on the stove top. As a general rule, reheat using a similar method to the original cooking process. Relatively liquid foods like soups, sauces, and curries respond very well to being slowly simmered on the stove top until they reach the desired temperature. Solid foods like lasagna, breaded foods, baked goods, potatoes, roasted vegetables, or meat reheat well in a low oven, 325 to 350 degrees F. Some vegetables and sticky foods like rice, pasta, stir fry, or seafood will reheat best in a steamer basket on the stove top. Another handy way to reheat leftovers is in a water bath. If you use reusable silicone bags to store your leftovers, just drop the entire bag in a simmering pan of water for a few minutes, and pull it out when the contents are hot. Naturally, you'd think the oven is the best choice for reheating pizza, but reheating in a skillet is THE way to enjoy your day-old pizza. Just put the pizza slice in your cast iron or non-stick skillet over medium heat, cover with a lid or tin foil, and cook until the center is heated through. You'll be rewarded with a crispy crust, melty cheese, and a toasty flavor that's sometimes better than the pizza was fresh. Leftovers might not be as good on their own the next day, but you can always turn them into something better. Use leftover meat for salads, wraps, tacos, and pot pie. Pre-cooked veggies work well in omelettes, quiche, frittata, and stir fry, Stale bread for croutons, french toast, or bread pudding. Breakfast hash is a fantastic leftover dish. You'll need some cubed or shredded leftover meat (or you can always use fresh bacon or sausage if you don't have any leftovers, or you can skip the meat altogether), chopped onion (or shallots, leeks, chives, green onions, anything oniony), cubed or shredded potatoes, whatever leftover veggies you have, and a couple eggs. Cook the meat in the pan first, set it aside, then cook the potatoes and onions in oil until golden brown and delicious. Add the veggies, heat through, add back the meat, season to taste, then add the eggs on top and cover until they're set. For amazing egg fried rice, the secret is to separate the eggs. Use one egg per cup of leftover rice. First, saute whatever leftover meats or veggies you have (frozen veggies are OK too) over medium heat, adding the egg whites toward the end so they don't overcook, then set aside. Coat your pan with oil and crank up the heat. Mix the egg yokes with the rice, and fry quickly over high heat. Mix in your other pre-cooked ingredients, season, and serve. Make fritters with your leftover veggies and starches. Take two parts cooked starch like rice, quinoa, or mashed potatoes, mix with one part shredded leftover veggies, and add a beaten egg or two (just enough to make the batter sticky). Form into patties, coat with breadcrumbs if you want, stash in the fridge for a half hour or more to help them hold their shape, then fry in oil until golden brown and delicious. What's your favorite recipe for leftovers? Leave it in a comment below.